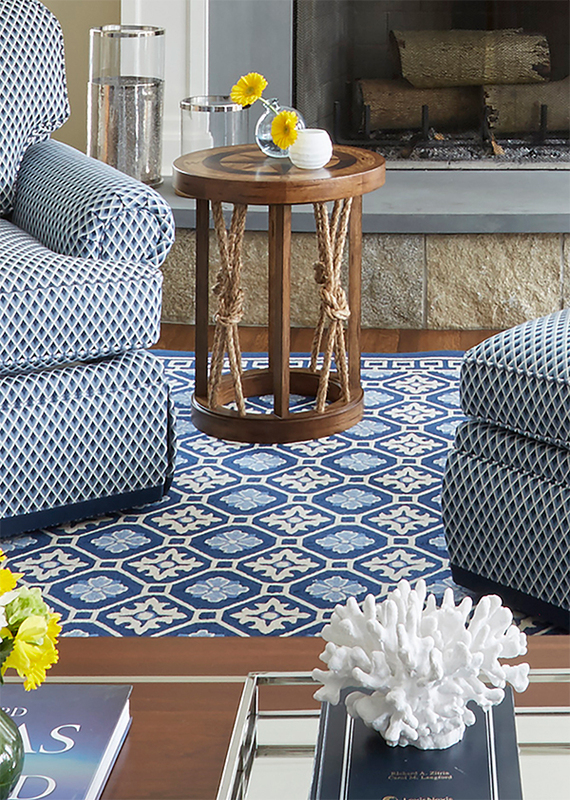 Blue and white is a consistent source for inspiration and enduring appeal. In this family room, the classic pairing offers a sense of comfortable elegance, filling the space with freshness and crispness, as well as an air of relaxation recalling waterside retreats, leisurely summer days and seafaring adventures. The family’s need for a room with ample gathering space was immediately sensed by Peabody’s. Her passion for blue and white matched the client’s request for a sophisticated yet accommodating room inspired by the East Coast. Fabrics of differing patterns in similar hues work well together. The dense wool rug was designed to anchor the space and endure beautifully. A custom made side table displays unique nautical detail. Plush seating, brass table lamps and mahogany tables provide New England tradition. Throw pillows and accessories elaborate on the seaside theme.